Okay, another Montessori insight. 🙂 She noted that young children have, what she called, a “sense of order”. I think I talk about it a lot. Perhaps this is because it keeps amusing me to have her (Montessori), proved right over and over in my observations. Below is a toddler, new at camp, who was not always the most pleased to be there. She really thought she had better plans for her day than this. Now you can help some children reconcile to their day easier than others. She did not want any of our help! In fact, when we talked to her, she screamed back. The first thing she discovered that made her feel better at camp was to sit in a chair. One chair, the blue one. She claimed it, and we were fine with that. We helped her move it, when she asked. 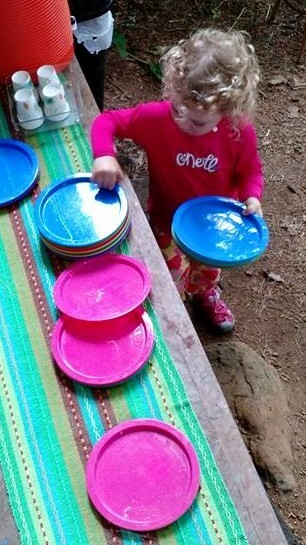 The next thing she discovered that was soothing was stacking the plates. She stacked, and restacked. She sorted by color. This kept her quite content for more than an hour, For several days. Montessori tells several stories of staying with families, and watching the child get very upset, for “no reason”. Later, it was determined that someone was carrying their coat, instead of wearing it, or something had been moved in the house. The first time I experienced this in the classroom, I was an intern, and the other intern and I decided we would take the 3s outside to the picnic table for lunch, since it was finally warm enough. An experienced teacher, walking through the lunch space, overheard us, shook her head, and muttered : “Sense of order. They will all cry.” We were sad for her bad attitude, then watched each child cry at lunch outside. One even lay his head on the table and sobbed. This does not mean that we have to give in to every request for the green cup, or the Power Rangers underwear, when they are dirty, or not to move to a big boy bed. It may mean that we are more understanding with “sense of order” upsets when there are other upsets going on. It may mean that we keep lots of things orderly and predictable. It also means, to me, that we can play into this natural sense (and, believe me, it is briefly lived. By 6, it is practically gone!) and set up routines for children that will become helpful habits of order.